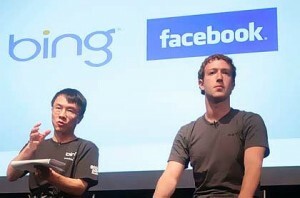 Beranda » Bing » Facebook » Bing & Facebook Search: What's The Relationship? Bing & Facebook Search: What's The Relationship? Silahkan klik tulisan atau gambar untuk lanjut membaca Bing & Facebook Search: What's The Relationship? . At first glance, Facebook's decision to partner with Bing to deliver web results for its new search functionality would seem a big win for the folks at Microsoft. The fact is, Bing has already been populating "Web Results" in Facebook's search, under a tab that says "Web Results." It's not a new development. The two have been working together for a while. The Bing logo started appearing in Facebook search results in June 2010. They announced a new partnership aimed toward making search more "social" in Oct. 2010. Bing was mentioned by Mark Zuckerberg in yesterday's announcement as a partner and Bing trumpets the new Graph Search in a new blog post, writing, "As part of this product, our two engineering teams worked together to advance a unified search experience." It is a unified experience in that when Graph Search can't give you the right results, Bing will come in with web results. But how much did Bing actually do with Graph Search? "Confirmed that Bing only powers the web search functionality on Facebook. We do not power Facebook’s graph search." So if Bing was already populating web search results for Facebook, and they're not powering Graph Search, what will they gain from the new search on Facebook? For one, they should be glad Facebook didn't partner with Google for those web results; According to TechCrunch, Facebook seems to have entertained that idea. Zuckerberg himself said "I would love to work with Google," but "People want flexibility, and that was the stumbling block with Google in our last round of talks." Bing should also be hoping that the new Graph Search leads to more people searching on Facebook. That indeed would lead to more Bing searches and traffic back to Bing. And the new Graph Search will respond to queries like weather with Bing results.